It is a typical cake of the Neapolitan pastry tradition, a sin of gluttony that everyone should enjoy once arrived in Campania. It has a classic shell shape, fragrant in the mouth with a soft and delicious filling, garnished with pastry cream and raspberries...have you understood what we are talking about? The Sfogliatella Santa Rosa, of course. An inviting-looking sweet rich in tradition, that contains within it the secrets of a distant history. The history began in 1600, in the Monastery of St. Rose from Lima in Conca dei Marini, on the Amalfi coast. The cook-nun (probably inspired by God or by the need to not waste anything) decided to prepare a mixture using a bit of semolina cooked in the milk, lemon liqueur, dried fruit and sugar; then she enriched the bread mixture with white wine and lard and created a pocket like a nun's hood in which she put the first mixture. Once out of the oven, the nun garnished the new cake with pastry cream and raspberries. 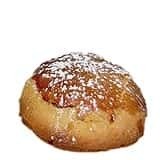 This delicious sweet was renamed "Santa Rosa", to glorify the Saint to which the monastery was dedicated. 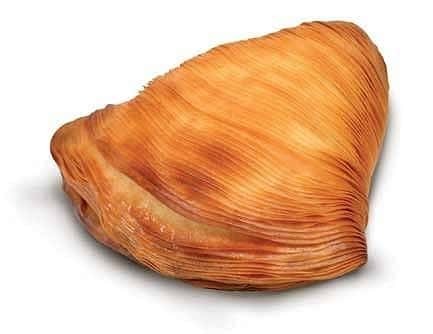 The recipe of the sfogliatella Santa Rosa was jealously guarded within the walls of the Monastery of St. Rose for about 150 years. In the early XIX century Pasquale Pintauro, a Neapolitan pastry chef, obtained the original recipe (probably from a nun aunt): he promptly changed it by removing the pastry cream and the raspberries. 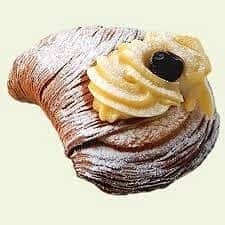 So he created the "riccia" (curly) variant of the sfogliatella: triangular-shaped, crunchy, composed by composed of layers of thin puff pastry overlapping each other, filled with flour, eggs, ricotta, candied fruit, milk and sugar. Finally, there is also a third variant of the sfogliatella, the "frolla" one, of round form, prepared with soft short pastry and filled with the same puff of the sfogliatella riccia.